A stocking is an item of clothing mostly worn by women, which tightly covers the foot and the leg up to the thigh. It can be made of cotton, nylon, or other materials. However, stocking can refer to Christmas stockings as well, those long socks that kids hang up on Christmas Eve for Santa to fill with presents. Bettina slipped on a pair of stockings. Personally, I prefer stockings to tights. I don't like how tights feel around my waist. 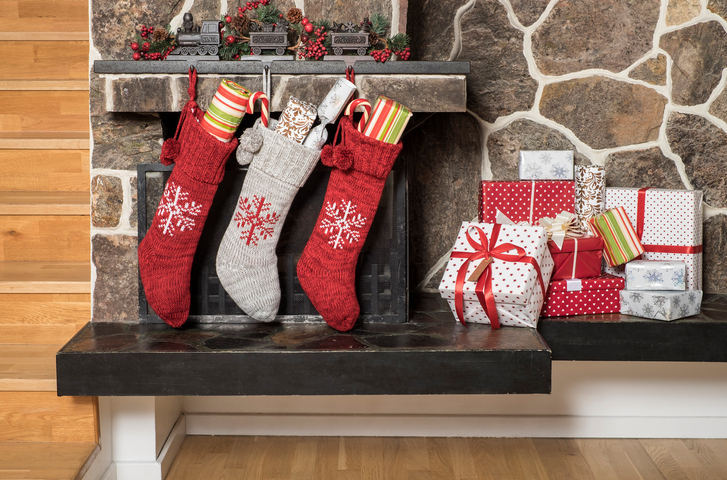 The children hung their stockings by the fireplace, hoping they would be full of gifts in the morning. Remember, Santa only brings good presents to good boys and girls! During the Second World War, nylon and silk stockings were difficult to get in Britain, because the fabrics used to make them were being used for making parachutes instead. Women used teabags to stain their legs and draw a seam up the back with an eyebrow pencil. As you can imagine, stockings were a sought-after item on the black market and when the Americans joined the war, stockings were among the most in-demand items American soldiers brought to Britain, which made them very popular with a lot of British women! Still not sure what stockings look like? In this clip from the 1957 musical Silk Stockings, actress and dancer Cyd Charisse does a dance with a pair of silk stockings and other fashion accessories. Stocking dates back to the late 16th century. It can be traced back to the Old English stocu (which meant ‘sleeve’), and is related to another Old English word, stocc (trunk or log). It originally meant a close-fitting garment covering the foot and lower leg (what we would now call a sock); the meaning was only restricted to women’s stockings in the 20th century. Santa has been filling stockings with Christmas presents since the mid-19th century.